There hasn’t been any missions since I’ve started it. I remember when I was like, 6, my moms friend gave us an Xbox for Christmas. Like, the OG Xbox. He also gave us a bunch of games, including GTA San Andreas. I loved that game so much, it was about the only game I played. I played it until I knew every square inch of the map. It got to a point that I even remembered certain bushes. I could be in a location and remember that last time that I was there. About 6 years later, my house flooded and I lost everything. I hadn’t played it since. Now I have the mobile version, and honestly? I didn’t think it would be all that, but it definitely exceeded my expectations. Thank you, Rockstar, for never letting me down, not one single time in my life. It won’t allow me to log into my account and play the game where I left off. Please fix this issue Rockstar! So we pay money for a game that’s always crashing and deleting our data. This needs to be fixed! All people have the same issue and none have been resolved. This is get into a building and kill everyone and steal all their money and the 👮🏼‍♂️won’t know it. The game is great and the story is too. But I want to customize my planes and helicopters like in GTA 5. I also want real police missions like arresting people and stuff. I haven’t completed the game yet but if I could make my own gang it would be awesome! Also maybe a new version with up to date graphics would be great. The game keeps crashing at the loading screen. I couldn’t get it to stop unless I deleted the app and redownloaded it. Except then I lost my entire progress. In an update you guys should have better graphics and different hair styles and different clothing and more trendy cars. I also think you should have multiple different songs in the dance club rather than just that one Snoop Dogg song that they play. I hope you consider these things in your next update. Best Game in the entire GTA Trilogy! Did you guys fix the FOV? Whatever you did keep it up, game plays and looks better now, idk if you made any visual improvements aside from screen ratio but whatever it is, it’s good. Fix the artwork image for loading screen on iPhone x because it’s not fit all the screen and please fix the position of police level status in top of the screen which overlap on the maps icon and the add feature to enter cheating codes. Was great for a week. Now I can’t even get passed the loading screen. Bummer. This app crashed as soon as I bought it. Not worth the money. I’ve never been able to finish this series on my Xbox 360 so I got the experience for my phone but I can’t even finish the game on my 95 mission because the game is glitch and will not continue with the storyline if it would be nice for some help or assistance with this simple but major issue. Save me the trouble of restarting my entire story progress it’ll be greatly appreciated Rockstar. 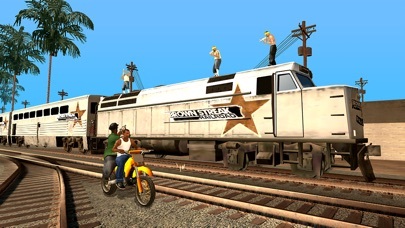 GTA San Andreas would make a good remake for GTA 6 with the owning territories and eating and working out to stay fit. Spending money at the casinos. They need to make a new gta like that. I am totally over the glitches in this game! I can’t even get into the game it keeps knocking me out! I paid seven dollars for this game I want a refund! Love this game glad I can play on my phone!!! The graphics are very bad☹️☹️☹️☹️☹️☹️☹️☹️☹️☹️☹️☹️☹️☹️☹️☹️☹️☹️☹️☹️☹️☹️☹️☹️☹️☹️☹️☹️☹️☹️☹️☹️☹️😭😭😭😭😭😭😭😭😭😭😭😭😭😭😭😭😭😭😭😭😭😭😭😭😭😭😭😭😭😭😭😭😭😩😩😩😩😩😩😩😩😩😩😩😩😩😩😩😩😩😩😩😩😣🙁🙁🙁🙁🙁🙁🙁🙁🙁🙁🙁🙁🙁🙁🙁🙁🙁🙁🙁🙁🙁🙁🙁🙁🙁🙁🙁🙁🙁🙁🙁🙁🙁🙁🙁🙁🙁🙁🙁🙁🙁😟😟😟😟😟😟😟😟😟😟😟😟😟😟😟😟😟😟😟😟😟😟😟😟😧😧😧😧😧😧😧😧😧😧😧😧😧😧😧😧😧😧😧😧😧😧😧😧😧😧😧😧. Why is there no Chinese? Why can't I add Chinese? is that really so difficult? I played it deleted it.because my other iPads just could not handle.the storage was too much. When will you guys add new things? I got so far in the game and then it wouldn’t load in and then it would send me back to the home screen and I lost everything , fix this . Don’t waste your time. You will have to restart game!! I really love this game! But that’s it I want my money back. I don’t care if it’s $6.99. This is the 3rd Time I’ve had restart. Rockstar I suggest you reach out to me soon. For the players... Don’t wast your time downloading. Everything runs smooth, I’m not having trouble doing any mission or whatever, no glitches, or crashing, but sometimes the buttons stop working when I’m using any of the controls. I was looking for a game that had a some shooter experience and/or driving involved and this fit right in! This game has both. I also didn’t want any in-app purchases or subscriptions. At first I was having trouble driving the motorcycle with the left and right “flick” controls, and I was going to grant this review four stars. But I discovered you could use left and right circular analog buttons and resize them and move them ANYPLACE on the face of your iPad. I’m probably about 1/2 of the way through this game, and find it extremely entertaining and worth the money! I see we finally got a full screen update for Vice City today... Thank god. Can we please have a full screen update for GTA 3? 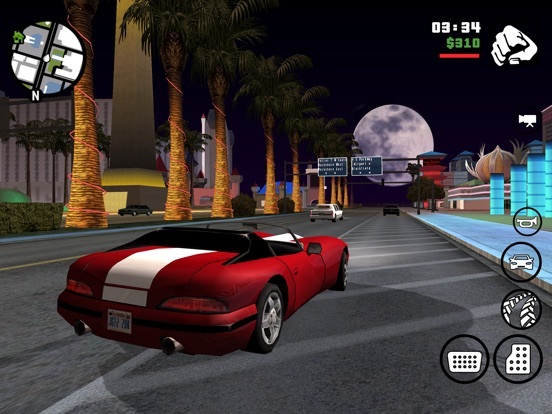 Also maybe an update for Vice City and GTA 3 to where you can use a controller like the San Andreas version? Mostly I like the button layout for the controller on San Andreas. I really think that GTA San Andreas is a really great game at adventure the map is really big and the game has a good history at the missions. 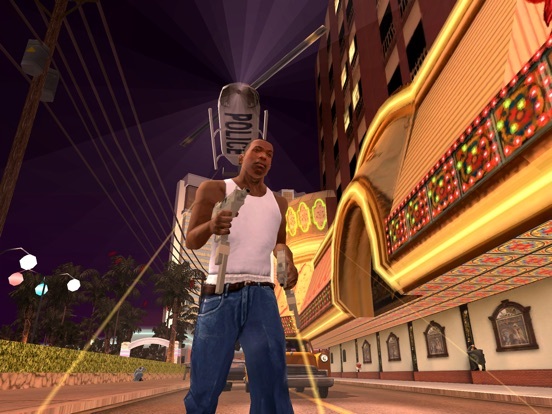 In the beginning of the game, there is a mission where you have to spray over Ballas graffiti. 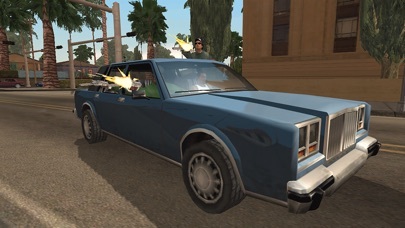 When you get to the point in the mission where you have to spray the Ballas in the face, it says that they are your arch enemy and if you hang around for too long, you will attract attention. 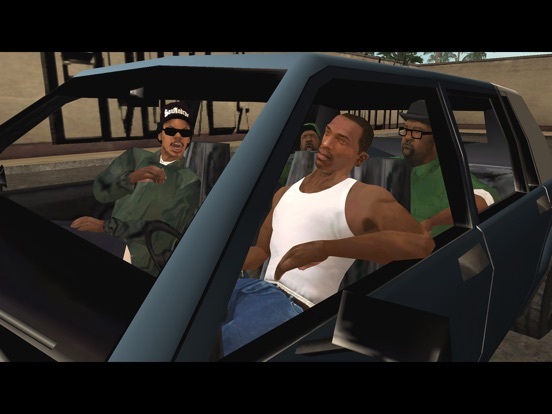 When i’m driving somewhere, whether i’m going to eat or go do a mission, and I pass the Ballas, they shoot my vehicle. Even if I drive by them fast, they still shoot me. And it’s not just the Ballas either. The Vagos also shoot me eitherways even if I just pass by them. But other than that, this game’s a really great game. Just aiming and shooting on a vechicle is needed. Can I get a refund? This game has not downloaded on my phone in hours and I’m just not going to play it. Rockstar were outdoing themselves releasing these legendary titles on Mobile. It’s like having a little piece of my childhood in my pocket. Priceless. I hope they release more titles like this and other game developers follow this as well. iOS needs mode ports like this. 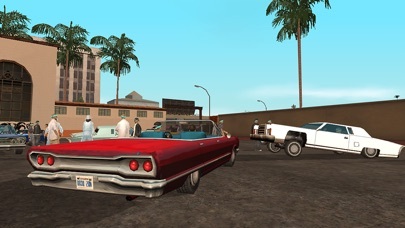 I love old games like gta San Andreas. I think mode game developers should port their games over to iOS. I was loving the game so far but I tried opting it up today and keeps crashing and after I restarted my phone kept crashing PLEASE FIX!! There should be a mode where there are no cops so you can just go around doing whatever you want without the cops. People would really enjoy more like a “creative” mode and more people would want to buy GTASA(your product). It’s been a while since I last played this and I thought about passing more missions again in this game. As I tapped on the resume button, it loads up so I can play the game and do whatever there is to do, but when the line that goes left to right on the bottom, when it gets to the end so I can play, it just takes me back to the home screen. This never happened to me before so I just found it odd, so are there’s like a certain thing I need to do or wait for more bug fix updates, I really want to come back to playing this game again. Until the last update everything was fine. After the update, it started working really slowly on my iPhone 6. I love this game and I’ve already beat it twice but the newest update has caused it to crash whenever it loads my progress (IPhone 8 plus running latest iOS). Please fix soon! Even after the latest update I am still experiencing trouble with the load screen. It gets to like 85% then automatically shuts off. I don't know if it's a Bug or Glicth.. The items you need to steal for burglary missions “Tv radio microwave” etc.. have a massive hitbox pull prompting CJ to go and pick them up. I get stuck behind a lamp in front of the tv and can’t move because the tv’s hit box pull is so large you’re stuck in a running animation against furniture like the lamp, chairs forcing you to restart. Also had this happen for items in the kitchen when I’m on the other side of a wall and CJ keeps running to steal the items. Behind a wall? How am i supposed to see that?! Also got stuck behind a door I opened because I’m too close to a radio CJ wants to steal stuck in a running animation against a door again. Lost three hours of solid mission grinding because of this. Had to restart. Can’t even kill myself. Or jump he just runs. As a result you need to re adjust the camera all the time and make sure you’re not in front of furniture when near items to steal. And if you detect an item you didn’t know was there behind a wall. Well bloodyhellsbells. I love the mobile version of San Andreas, it’s so much fun going on a bunch of missions and game play is very easy to understand and fairly easy to play as well. However the game will not stop crashing which can be very frustrating while I am in the middle of a mission and will have to restart. At one point, about a day after my download the app would load at all and would crash while on the loading screen and I would not be able the play, the happened repeatedly and my game would not load so I tried to delete and redownload thinking that the point of signing up for the social club was to save your progress, but I was mistaken and the game make we start from the original state and I had lost all of my progress. The game still crashes from time to time, hoping that that doesn’t happen again though or I will be deleting my app. Not happy that I payed $7 for an app that keeps crashing. First of all, thanks for making this game available on iOS. Big shout out to Rockstar for that. There are a bunch of glitches but the game is still worth the purchase. I’m using in on iPhone X even thought it says it’s not supported. First glitch is the there are times where the steering wheel when driving is stuck on one side so it makes driving hard. What’s funny is I use to have this same issue on the original Xbox all those years ago and I use to beat the crap out of my control thinking it was my control, turns out it’s the game. The other issue is that it randomly exits out the app, it’s especially annoying when your half way or almost done with a mission because it makes you restart it from the beginning. Other than that there isn’t any other big issues that I can say are enough to turn me away. GTA is the best game of all time. Hopefully you guys get GTA V on here at some point. So many glitches I can’t even count them. First off, I’d like to say that I love this game so much and I play it pretty much everyday. Aside from that, I wanted to point out the problems I’ve been having which also get in the way of me completing missions. The cars go so fast on the streets that they submerge into each other and explode. If I’m driving my car or bike is likely to get caught up into another car and blow up. Cars even go so fast that they fly in the sky. I deleted my app, and reinstalled it, restarted/rebooted my phone, and followed everything everyone advised online and nothing helps. I’m on the mission where I have to drive the DAs car to the garage spotless but I always fail the mission because cars always submerged into me. Sometimes my car will even get stuck into the ground where half of my car is in the ground and half of it is out but every time this happens, my car explodes. Please fix this and the game will get a 5 star rating from me. Thank you. I was a bit skeptical at first buying this, as I expected a mobile version of a console game to be severely crippled in a couple ways. As it turns out, this is legitimately the full San Andreas, slapped on top of a faster processor than your PS2 could ever fathom. The graphics are better and load significantly faster than before. The controls are a little clunky, but that’s a side effect of the small screen I’m playing on. After getting used to it, the game handles the same as it should. I even beat the mission “Learning to Fly” quicker than I would have on a console. 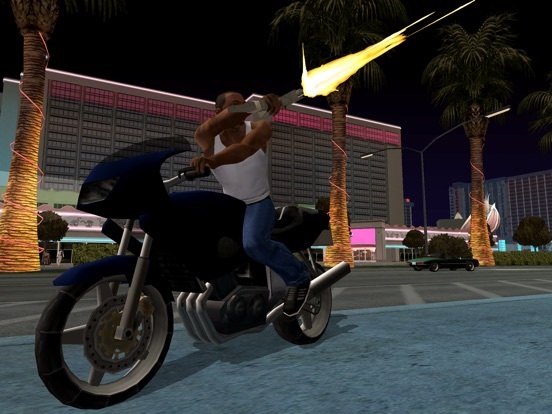 I have a feeling that certain features of the game have been “dulled” or made easier to compensate for the controls— get on a motorcycle early on in the game and you’ll see what I mean. The only downside as far as I can tell is that there are no cheats in this version. This is a really big bummer, as the cheats in this game are like a separate game built in. There is a way to modify traffic in the game, from heavy to classic to light, which is helpful on missions where you are punished for hurting your vehicle or during races. 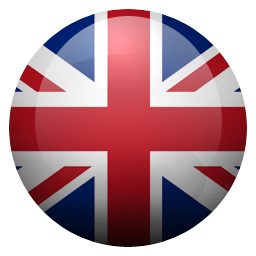 All in all, if you like this game, this is a perfect app for you. If you never have played, it’s well worth giving a shot. The game is as fun as I remembered it however, the controls take some getting used like shooting and looking around to shoot works so so, and the jetpack isn’t so easy because it should fly like the helicopters controls but it controls are like driving a car the reason being is the rotation control you get flying a helicopter doesn’t carry to jetpack making the green goo mission a bit tough but still playable and for those who didn’t know there is a setting in game that makes automatic acceleration turn that off if you’re car or motorcycle is driving like its being pulled to one direction the game is still fun, but if you plan on buying this app do not expect the devs to fix or add something, because R* isn’t supporting the apps updates anymore. I mean I only paid 6.99 for it and it’s my favorite game but it keeps turning off on me in the middle of missions? Come on man I was surprised y’all could get the greatest game ever on an app but that does get frustrating sometimes when your into the game or in the middle of a mission at least put an auto save on there or a save option where you can pause the game and save it for the mobile app because I see this is happening for a lot of people I have an iPhone X just like millions of people this shouldn’t be a problem but it is so it should be either fixed or put a quick save option where you can pause the game other than the safe house so people who keep getting this problem won’t be annoyed. So a few years ago I bought this game on my iPod 5, and it ran PERFECTLY never ran into any problems. Later I got the game on the Samsung s5 and once again no problems. But when I got the iPhone X I noticed if I play the game on this phone it will randomly crash, I could be playing for 5 minutes and it’ll crash and other times I would be playing for a good 30 minutes and all of a sudden boom. Game crashes and I lose all of my progress. I doubt rockstar will pay attention to this game anymore but please fix these issues, also make this game compatible with the iPhone X so it fills the whole screen. This phone is insanely powerful it shouldn’t have a hard time running this game. Hey, I want to say that this is one of the best game for IOS out there. I already completed the game twice and I'm starting to play again for the third time. It's totally worth spending $7 on this game, however I have a few problems. I don't know if it's part of the game or if it's an unfixed glitch but can u PLEASE add an update where u can customize all the cars that I try to bring into the mod shop? There would be a car that I would want to customize and the mod shop won't open at all, but then when I drive a different model car, the shop would open but then it would say that the vehicle can't be modded. How does that make any sense? so can u please update for all cars to be customized and add more stuff like the front bumpers and back bumpers and more variety of colors and wheels? Crashes and can’t resume my gameplay! The game is the best on the phone but the only problem is the vehicle turning... At least for me, probably cause I also use a Bluetooth remote that also works with this game but I'm not entirely sure, almost whenever I load the game and I'm in a car or I find a car... Every time I drive forward one the wheel is also stuck slightly turned or all the way over to one side... Some times it works great and I don't have this problem or it comes in Shortly after or it's just stuck that way... Please please please fix it if you can or if comments can be made on this, cause I don't write up reviews often on app store, if you have any tips please help me. I've tried almost everything I know. Someone else has the same problem, and it’s annoying, every time I tried to log into social club, it won’t work, and I’ve tried deleting the game, resetting the password, and even shutting off the wi-fi, which was the cause of the problem. If you’d stop making DLCs for GTA5, and start focusing on one of the best rockstar games, (this one) maybe less problems like this would happen. If it is not able to be fixed, then I want a refund. Thank you for your time Edit: fixed it, just logged in through social club website, almost thought I lost all of my progress for a while there, sorry. My game has been crashing for weeks and nothing I do seems to help. I’m so disappointed in this app and would love a refund. The makers of this app do nothing to help make it better. Updates don’t happen for months and if not years (last update was 6 months ago). If you read through the reviews multiple people can’t even play because of a problem with the game crashing or constant glitches and to make it worse nobody even acknowledges the issue or seems to want to fix it. Waste of money for an app I can’t even use. I’m so upset because I actually liked the game at first but now I’m just frustrated and want my money back. If I would have read the reviews first I never would have downloaded it in the first place. Way too much money for an app that doesn’t even work! Wow so much nostalgia in this game. Remember playing it everyday on ps2. Talking about this game with my friend and learning new stuff around the map. I got myself and MFI controller and I’m more hooked playing the game. But I would love if you guys could make an IPhone X update so the game can fit better on the screen. Still look good but would like a wider view. Thanks rockstar!! Edit: yes!! Developers read and they did a iPhone X update. But there are some bugs appearing. I play with a MFI controller support and when I access the map it won’t let me go to the right and the game is crashing after a couple of minutes. Still love that you guys updated it. Hope you can do this for us Pleaseee!! Hi Rockstar Productions! 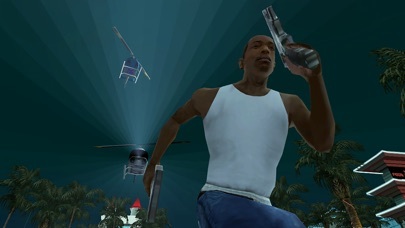 First of all I just want to say that I love the games you make like this one, GTA San Andreas. I have just completed the game and my brother is almost there. That's when I had the idea to ask you guys something which might be a lot of work but I am pretty sure that everyone else who play this game would also want it also. Ok so my question is that can you guys please add a "Online Multiplayer Game Mode in GTA San Andreas so we can play with other people? Many people would want this so can you please add this in the game?! And can you also add CUSTIMISIBLE CHARACTERS THAT WE CAN CREATE AND ALSO ADD PUT OWN NAMES?! Please do this and thanks in advance!!!! Honestly the game is wonderful I’ve played it on many different platforms such as ps4 and the iPad it’s great have all of the same missions and aspects which was something I was worried it wasn’t going to have since after all it was only 6.99 the only problem is that the game has kicked me off several times like when doing missions then I’m forced to start them over which is fine for now speaking that I’ve only had it for two days I’m on like mission 20 or 21 anyways today I tried to get on all it does is load then kick me off please fix this I really hate to complain knowing you guys try your best enjoy the rest of your day thank you . After a while of playing, I’ve progressed 30% into the game. However the game has crashed too many times, especially during missions. The game is without a doubt a 5 star game, but I give it a 2 star because the crashes ruin everything. Halfway through a mission, I’m more scared of the game crashing than dying. I save more often than usual. What’s even worse is before it can hit a checkpoint in a mission it crashes, and I’ve spent 10 minutes playing it. It’s just a horrible feeling knowing your hard work has been reset, and I can’t keep replaying a mission over and over hoping it won’t crash. 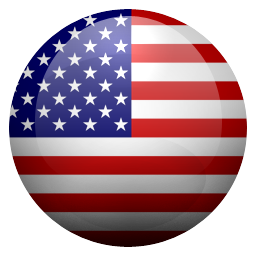 I’m playing on an iPhone X version 11.4.1. Maybe it just needs an update, but right now the game is unplayable for me. This game is amazing and I love it. But I have the iPhone 8 Plus and it says it’s compatible with my phone but its been crashing lately when I start up the game. I’ve already updated my phone to the recent iOS and even turned off and on my phone and nothing. I really love this game but I can’t play it now. It will load up and the loading bar will fill up to almost the end then it fills up and crashes. I’ve had to uninstall it and reinstall it for it to work. I don’t want to keep doing this and lose my data all the time! This is a cool game to have on your phone. If you’re ever bored and you don’t have anything to do this is a great way to waste time. 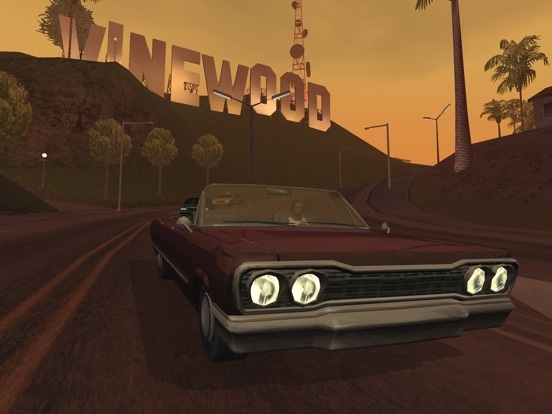 Also this is a classic game that never gets old, it’s a game that really put grand theft auto on the map for the ones who regularly didn’t play. This game was my favorite game of my childhood so that’s why my rating is kind of biased towards the 4 out of 5 rating. The graphics are not the best but it’s manageable to play but that’s how all the games would look from the time they were made. The downloading process went by very fast and I got happier than I was when I got the game on my PlayStation 2. I’m not sure if anyone else is encountering this issue. Whenever I play the home invasion missions CJ sometimes gets stuck walking towards an object outside of his reach (usually near the rectangular tables). I cannot make home jump out of it, the controls do not respond. I then have to reset the entire game to try again to hope that it doesn’t happen again. This has happened to me atleast 4 Times so far. Other than that, this is he exact game I remember playing when I was younger and I am glad that I can access it on my mobile device. Please rockstar fix this bug / glitch!! I personally Love San Andreas, and have been playing it since the original release on PS2. However I have been having problems with the game crashing, it will randomly kick me from the game and once returning to the app it is as if the game restarted and I am back at the home screen hoping it saved before then. I’ve also had to uninstall and then reinstall the game for crashing during the loading sequence. It has not let up with the random crashing even after uninstalling, losing all progress, and restarting. The game is great and I Love that it is for mobile devices now however it needs a serious update for the glitches and crashes. Just like all of the other GTA ports that have made it to mobile, this one is great. The controls are pretty good, the gameplay is of course fun. One thing that I wish was available (in each of the GTA ports) would be that ability to cheat. I've played through each of these games several times and to be able to spawn a vehicle or weapons would be really convenient, and casually gratifying. It is a great game though, from an era when you could just play a game and enjoy it, and not have to worry about the thoughts and opinions of "social justice warriors". So i just got the game and its super good the missions are awesome the storyline is great and the game is just beautiful the graphics are bad, but i like that. It reminds me the old games. Theres a glitch or lag though i got to the forest map and i was doing a racing mission but then it kicked me out the game and then every time i log in the game loads half way then backs me out i hate this and i really want this to be fixed. I worked so hard just to get to that mission and area now i have to RESTART THE GAME and boy do i hate doing that now it just makes not want to play anymore. Hope the game gets fixed. Alright first of all I was very hooked on this I loved this game and spent hours playing it. I was doing a mission for Cesar and for some weird reason it started to crash when I wanted to start the race. I restarted my device and it didn’t work. So I redownloaded it to find that my files did not save. Honestly it was good until this happened. Don’t even bother buying this. Why spend money on something that will not even save after you spent hours playing it. It’s a HUGE waste... not even Chinatown wars did me dirty like this. I’M VERY VERY DISAPPOINTED 😒 I caught up and redid what I lost.. I saved it this time but after trying to complete the mission Farewell My Love it crashed again, it’s been a few days (since Friday) that I haven’t been able to play it. Not bad but a few things. So I will agree this is the best 3D gta game. I have a lot of fun playing it and lots of variety. I only have a few complaints. One is the shooting controls. I pretty much only use the lock on since the auto aim has you aim with the right finger. But problem is the right side is also the button to shoot so it ends up feeling awkward to use. 2 is the territory’s. Some ballads of vagos territory are really small to the point where no enemies respond so that territory ends up feeling next to impossible to take over. But aside from that I really do have a blast playing this. So im playing gta sa, enjoying it. And i just completed the “Just Business” mission. Next thing i know, big smokes name isnt on the map. I have had to restart my game numerous times because of this. I lost OG LOC missions, i lost Cesar missions, ive lost Ryder,Sweet, bla bla bla. Ive also lost C.R.A.S.H missions. Please fix this. Because even when i show up to the houses of these missing characters, the marker is gone as well. So i need to know what to do before i can never play the game again. Because now everytime i restart, ill just expect my missions to disappear, driving me to not play the game. And i know you dont work on this game anymore but, this is a major glitch for me. Just please fix it, or tell me if im doing something wrong. I love this game, & would continue playing it for hours, IF it wouldn’t completely sign me out of the game while playing. I finish missions, then on my way home to save i'm booted from the game, upon returning i’m at the last mission that was saved! meaning all of my progress was lost. This glitch doesn’t only happen after missions, it can happen at any time during gameplay. Rockstar if you are reading this please fix it so I can enjoy gameplay. ALSO, my boyfriend has purchased the game on his Samsung Galaxy Note 8, and the glitch occurs there as well, i’m using an iPhone X.
i love this game and it’s super entertaining. Yet every time i do a mission it always crashes. so i cant even enjoy it. every time i’m almost done with the mission it crashes so then i have to restart the whole mission again and that’s super annoying. that honestly just makes me want to stop playing the game all together. and the last update was 8 months ago. i have an iPhone 8 plus and in the description of the game it doesn’t say that it’s compatible . please fix this bug!!! i really love this game but i cant play because of the dumb bug . I deleted this app a few months ago ( yes even after paying for it) because it was force closing. I'll try to download it again and hopefully it isn't force closing anymore because it's disappointing. There are also a few glitches within the app for other than that it's fun. The glitches and force closing is why I rated it 3 stars instead of 5 Update: I downloaded the app again, worked for a few days now it is force closing again. I have the iPhone 8 if the game is compatible with iPhone X I should have NOOOOO problem. Please fix the force closing for refund me my money. I love GTA, I grew up playing it and this iOS app is a nice addition because I love playing it then putting it in my pocket. The problem is though that for some reason when I start it CJ is falling through the ground, I can swipe around to see some buildings for a half a second but I just keep falling. He knows he’s falling too because he’s saying stuff like “Gravity’s a b*tch”. I’ve restarted the app and my phone and it hasn’t helped. I really would like this problem fixed because it’s become a part of each day for me. I love this game so much. I hope the devs are listening to this. I love this game but I recently had a problem. I feel when you spray a tag it should auto save. During the mission Tagging up Turf I decided to get all 100 tags. After I got all 100 tags, which took about 2 to 3 hours by the way, I then got busted by the cops right after getting the last one. I then go back to the mission and it resets all of the tags I have done. I have now decided not to play the game as all of my hard work to get those tags has been thrown out the window. Please make it so only the 6 tags in the mission reset. That would make more sense. 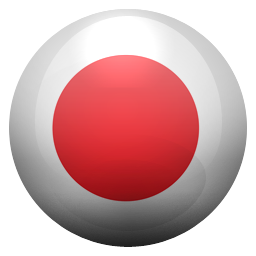 The game is amazing, I loved it works perfectly but there's one thing, sometimes I want to listen to the radio station and I found a bug when I was listening to the music. it's not playing the music (in the radio station ) smoothly, this is all of them actually all stations they play like normal and then like cut it off and join to another music it even didn't finish properly. So yeah please make an update to fix the radio station for the iPhone 5c please. I love this game! It runs exactly like San Andreas on console, exactly like you’d expect it too. They gave the controls a selective design so the buttons don’t clutter the screen. The only problem I seem to be having is with clothing shops not allowing me to buy clothes. There is no red circle or a cashier that allows me to Purchase clothes nothing appears I even did the Ak’s and Nine’s mission to unlock clothing but still can’t purchase any because the circle doesn’t show up. Everything else works fine but the clothing is broken as of right now.